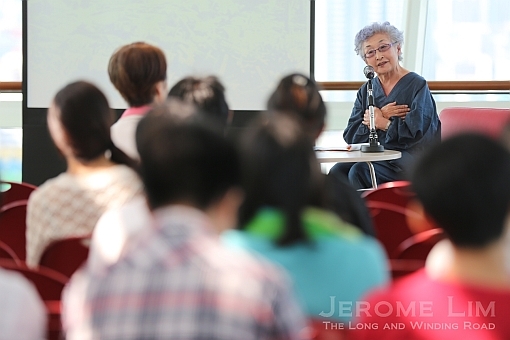 It was two Sundays ago at the National Library’s the POD that the opportunity arose to hear the accounts of the Hibakusha. 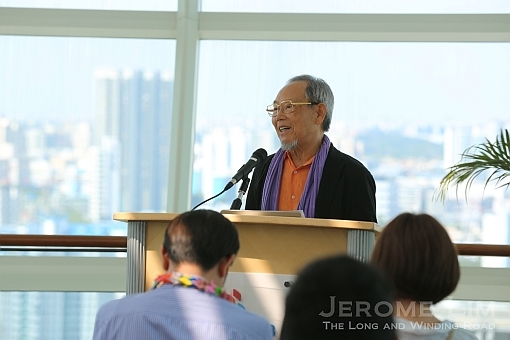 Survivors of the atomic bombs dropped on the Japanese cities of Hiroshima and Nagasaki close to seven decades ago, the group of seven, together with other participants of the Peace Boat Hibakusha Project, were in Singapore to share their remarkable accounts of survival in the face of the effects of what has to be one of the most horrifying weapons mankind has employed in an armed conflict. The project, has participants making a global voyage on a passenger ship, and is aimed at promoting peace and sustainability and ultimately, a nuclear-free world. Small group discussions with the Hibakusha at the POD. It is much more than time and distance that separate us from the horrors of a war in which Singapore had been very much a part of. We in the Singapore of today, have had the good fortune of being separated from some of the conflicts of more recent times and it would be very difficult for us to imagine what it was like living through the war, let alone attempt to comprehend what the survivors of the atomic bombs must have lived through. Mr. Lee Jongkeun, a second-generation Korean resident in Japan who was 15 when the bomb fell on Hiroshima. The first of the Hibakusha we did hear from was Mr. Lee Jongkeun, not a Japanese, but a second-generation Korean resident in Japan. Aged 15 when the bomb fell on Hiroshima, Mr. Lee spoke, among other things, of the discrimination he faced, even to this day, as a resident of Korean origin. The presence of Mr. Lee, also highlighted the fact the the victims of the a-bomb weren’t just Japanese, but also many other nationalities. The victims included some 70,000 who were forcibly brought from the then Japanese colony of Korea to work in Japan, as well as Chinese who were there in similar circumstances and also the many prisoners of war being held in the areas at the time. Ms Michiko Hattori, who was a 16 year-old nurse 3.5 km away from the hypocentre in Hiroshima. 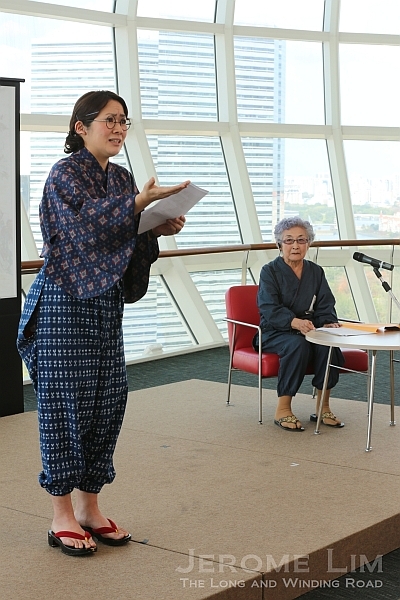 Following the testimony of Mr. Lee, there was a short performance by Ms. Ayumi Hamada – an actress and a youth participant in the Peace Boat project, who recited a poem, before another Hibakusha, Ms Michiko Hattori, spoke. A 16 year-old nurse with the Military Medicine Department in Hiroshima at the time of the bombing, Ms Hattori, she was only 3.5 km away from the hypocenter, and related some of the horrifying scenes she encountered after she recovered consciousness and attended to the other casualties in the aftermath of the bombing. Ms. Ayumi Hamada with Ms. Michiko Hattari. 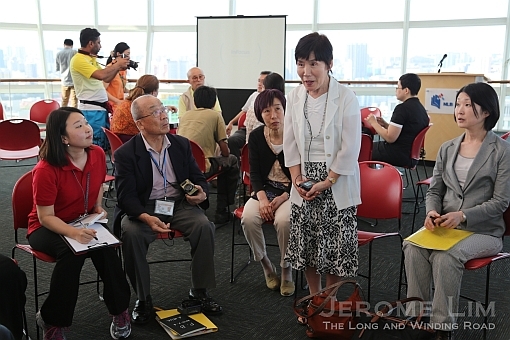 There was an opportunity to also hear from the other Hibakusha – all with a common tale not just of what was encountered in the immediate aftermath, but also of the discrimination they faced long after, along with the after effects of exposure to radiation that left many with long term illnesses and the fear many felt of what were uncertain futures. Many had difficulty finding marriage partners as a result. Ms. Nobuko Sugino, who was 1 year old and 1.3 km from the hypo centre. Ms. Nobuko Sugino, who was a year old when the bomb was dropped, and at her home 1.3 km away from the hypocentre, was too young to remember the aftermath. She spoke of the fears she had growing up due to the exposure she had to radiation. We were reminded of the story of Sadako Sasaki and the 1000 origami paper cranes. Sadako was 2 at the time of the bombing, and at her home at a distance of some 1.6 km from the hypocentre. She had been in good health for some 9 years before she became ill and was diagnosed with leukaemia before dying at the age of 12. Sadako had attempted to fold 1000 paper cranes in the hope that it would allow her wish to be granted by the gods, falling short of her target before the disease claimed her life. 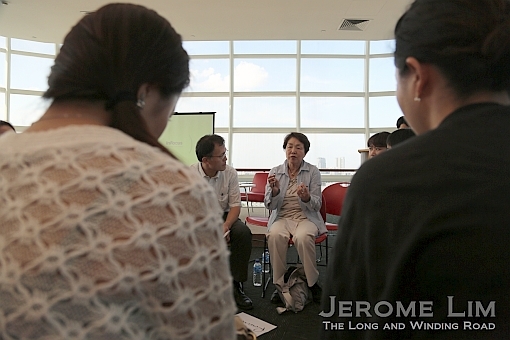 The story of Sadako had many like Ms. Sugino fearing that they might suffer a similar fate. Ms. Noriko Sakashita, who was 2. Ms. Motoko Nakamura who was 11 months. 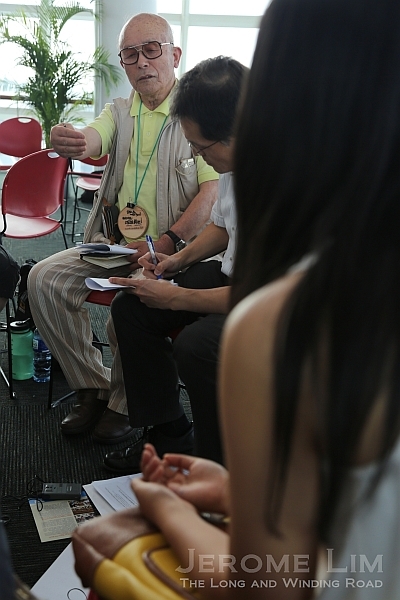 Another survivor that did recount what it was like in the immediate aftermath was Mr. Takanari Sakata. He was 15 and working at the Mitsubishi Heavy Industries shipyard in Hiroshima as a part of the mobilisation of students. He has very vivid memories of the scenes that he was to witness after regaining consciousness. He spoke of the scene that greeted him as he had walked across a bridge near the only building that had been left standing in the hypocentre – what is today the iconic A-Bomb Dome that serves as a memorial. From the bridge, one side of which had collapsed inwards and the other outwards, he could see many blackened bodies of victims in the river and many who had survived asking for water, which he was advised not to give as it would have killed them. Mr. Takanari Sakata, who was 15 and working at a Mitsubishi Heavy Industries shipyard in Hiroshima, 3 km from the hypocentre. 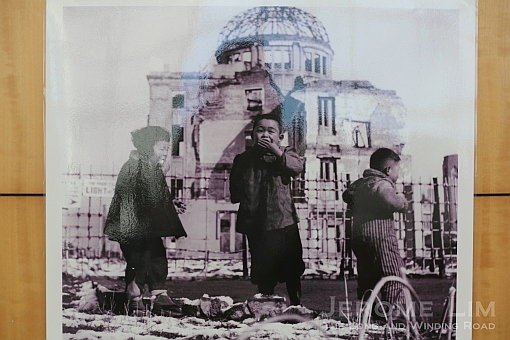 It is in hearing from the Hibakusha, who have shown great courage and determination in attempting to reach out to the world in the hope that their testimonies will help with the realisation that the experience they had been in, should never again be repeated and it is only with a nuclear-free world that the risk of it happening again will diminish. 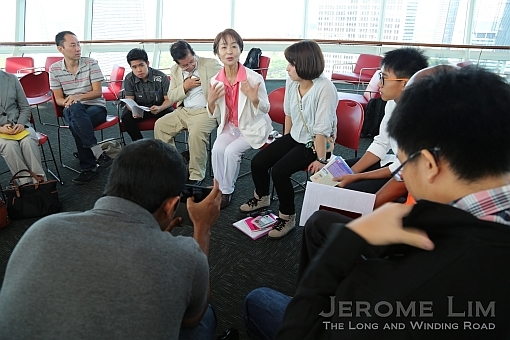 On the Peace Boat, now in its seventh global voyage for a nuclear-free world, with the Hibakusha, are several youths who hope to raise awareness of the need for a nuclear-free world to fellow youths worldwide through their participation. 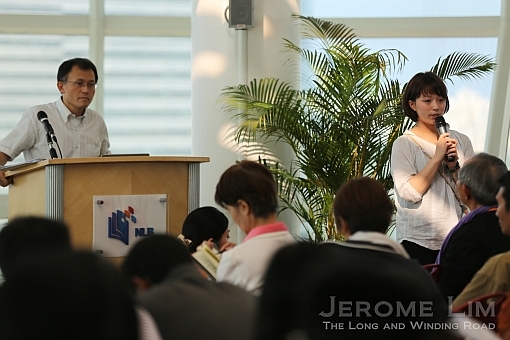 Besides their involvement in workshops, they hope to interact with the young from different countries. The Peace Boat, having left Singapore, continues on what will be a 104 day voyage around the world that will see it calling at 20 ports in 18 countries, before returning to Yokohama on 24 June 2014. More information on the project and the Hibakusha can be found at the Peace Boat’s website, www.peaceboat.org. An image of children quenching their thirst on snow that had covered the hypocentre in Hiroshima on display. 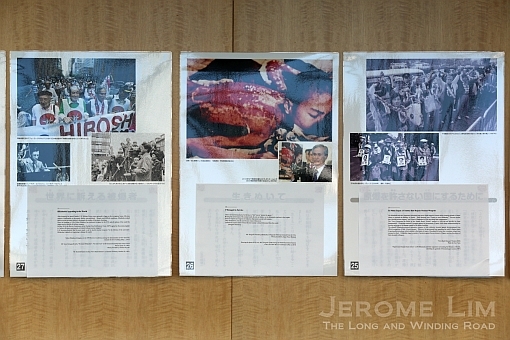 Some of the horrifying images seen in the aftermath – on display at the session.